Our state-of-the-art services, including hydro jet drain cleaning, help prevent clogs and backups. Clogged drains that back up are a major headache to Orange County homeowners. One of the smartest things you can do is contact a leading plumbing company so that a qualified, experienced plumber can come out to your home and provide you with expert drain cleaning services. Regular drain cleaning is an incredibly important part of proper home maintenance. A drain that is not cleaned regularly and on a timely basis can get clogged, making it significantly more difficult and expensive to clean later on. Water that is slow to drain has the potential to permanently damage the plumbing fixtures in your Orange County home, which can lower your home’s resale value. Additionally, stagnant water can cause serious health problems to all the occupants in your home. A clogged drain harbors germs and encourages the growth of mold, which can cause health problems ranging from itching eyes, sneezing, and coughing to serious allergic reactions, asthma attacks, and permanent lung damage. It’s always a smart idea to have your drains regularly cleaned by a professional plumber—it’s a critical preventative maintenance measure that will preserve your home’s plumbing fixtures and allow you to avoid very costly repairs down the road. But if the need arises for emergency sewer cleaning—contact Barker and Sons Plumbing & Rooter for 24/7 Emergency Service. 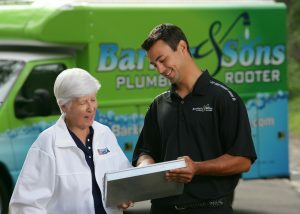 At Barker and Sons Plumbing & Rooter, we specialize in hydro jet drain cleaning, which involves blasting clogs in your pipes with a high-pressure stream of water that will break up your clogs and send them down the drain. Hydro jet drain cleaning is far more effective in cleaning Orange County drains than a traditional drain snake is—and it consumes far less time. Hydro jet cleaning is a service that is especially necessary if you have a drain that has been clogged over time with a heavy-duty residue like grease, soap, or sand. After some years, these substances can build up in your drains and eventually close up the drain. This is not the kind of blockage you can fix yourself and not even a situation where you can use a drain snake to completely unclog your drain. Read more about the differences between snaking drains vs hydro jetting. Hydro Jetting is the next generation in drain cleaning and maintenance. While rooters simply use mechanical action to punch a hole through clogs and debris to restore flow, pressurized cleaning uses the force of water to actually scour the inside of your drain. Hydro jetting not only restores flow but can remove grease buildup inside the drain, which helps prevent costly future problems.